Is 93% of communication non-verbal? Why is it nonsense? Two reasons. Firstly, it is based on findings from experiments dealing with the communication of feelings or attitudes: Unless a communicator is talking about their feelings or attitudes, these equations are not applicable . Secondly, those experiments were narrow and artificial, based around the interpretation of single words. It's a real stretch to extend those findings to communication as a whole. To see what I mean, let's take a look at the experiments. 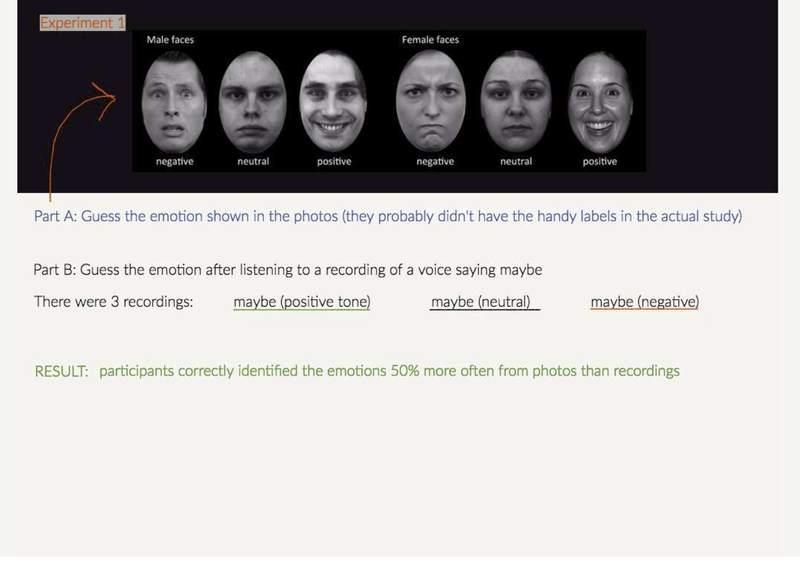 The first experiment compared participants ability to detect emotion in someones voice versus through their facial expressions. The word maybe was said in a positive, neutral or negative tone and participants had to identify the emotion. This was compared against their ability to identify the same emotions from photos of a face. The communication in this task is arguably all non-verbal, the word maybe was chosen because it was information poor on its own. Participants were 50% better at identifying emotion from the faces than the tone of voice. The second experiment investigated whether participants would be more influenced by the tone a word was spoken in than the word itself. The 9 words selected fell in to 3 categories: liking words, neutral words and disliking words. Each word could then be pronounced in a positive, neutral or negative manner. Participants were asked to identify which emotion was being expressed by someone saying the word terrible, positively, or thanks, negatively. They were more influenced by the tone than the words. As you can see, these experiments were highly specific and contrived. Not only do they relate only to feelings and attitudes, they only relate to feelings or attitudes expressed in a misleading manner with a single word. They also had a sample of 37 female psychology majors. It's remarkable that such a pervasive myth has sprung up from such narrow and arguably irrelevant evidence. I'm sure there's something pertinent to say about the importance of fact-checking but we'll save that for another day and let Mr Mehrabian have the final word on this one: Suppose I want to tell you that the eraser you are looking for is in the second right-hand drawer of my desk in my third floor office. How could anyone contend that the verbal part of this message is only 7% of the message?